Between all the channels carrying the Susan Boyle video on YouTube, the video of her singing "I Dreamed a Dream" from the stage musical Les Miserables on Britain's Got Talent must be approaching 100 million hits. A worldwide phenomenon, Susan has brought jaded, grown men to tears. How can this be? What is the magic in her performance? Simply put, she was a longshot. When she walked on that stage, 47 and frumpy, odds were 50 to 1 that she was a comedy trainwreck placed in that position by cynical producers eager for ratings, a buck, and a better parking space. Worse yet, we even suspected she was a little "slow" when she struggled to bring up the word "village" and swiveled her hips to a "that's just one side of me" joke that didn't quite make sense. But when she opened her mouth to sing, we were transported by the power of her voice and the emotional resonance of the lyrics she chose to share. As she pursued her dream, she reminded us of our own. We wished for her success as we wish for ours. We pulled for her. We rooted for her. And, in return, she transported us to the place where her dreams and ours can and do come true. Similarly, on Saturday, May 2nd, 50-1 longshot Mine That Bird took to the field in the Kentucky Derby at Churchill Downs. With a distinguished record of losses and only a single graded stakes win to make him eligible for the race at all, Mine That Bird, ridden by jockey Calvin Borel, rode the rail from dead last to win by at least six lengths. 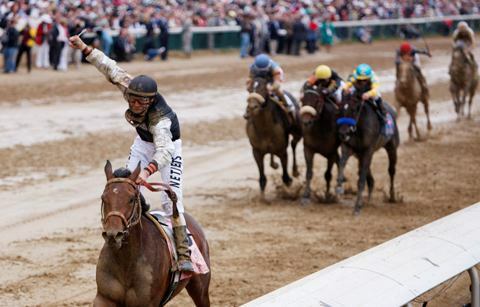 He won his owners $1,417,200 and paid $103.20, the second largest payout in Kentucky Derby history. A gelding once auctioned for only $9,500, working with a trainer on crutches, driven cross country from New Mexico in a van, Mine That Bird, much like Susan Boyle, had everything working against him. On top of all that, the track was sloppy from overnight rain. Not only did he win the Derby but he placed second only half a length behind Rachel Alexandra in the Preakness - and she a legendary filly. That's what we love about longshots: they succeed in their dreams and remind us to pick ours back up and run with them, even through the darkest of nights.